Close by are all the delights of the Lizard Peninsula, the hidden coves and breathtaking beauty of the high cliffs, you're never far from the sea here. A little further and historic towns such as Penzance, Falmouth and St Ives are all easily reachable in much under an hour. Entered through the front porch, the quality of the property is immediately apparent with its wooden floors and fresh decoration. The double bedroom is well appointed with 4'6" double bed, bedside tables with lamps and good storage space, the small single room has a full size single bed, bedside table and lamp, and a door out to the shared enclosed gravelled area. The fully tiled family bathroom has a bath with power-shower over and a matching toilet and handbasin with mirror and shaver point over and a heated towel rail. The large living area consists of the lounge with comfortable seating an LCD TV with Freeview and DVD player, well-equipped kitchen with electric oven with ceramic hob and extractor over, microwave oven, washer dryer and fridge with a freezer compartment and dining area, and great views of the harbour. Rental includes bedlinen, towels, electricity and central heating and free Wifi. Outside is parking for one vehicle. One well-behaved dog is welcome by prior arrangement at £25 per week. No smoking. Short Breaks with a minimum of three nights may also be considered, please phone with your requirements. Also see property number 442 - Fisherman's Loft, 509 Tregwyn, 510 Tremellin. 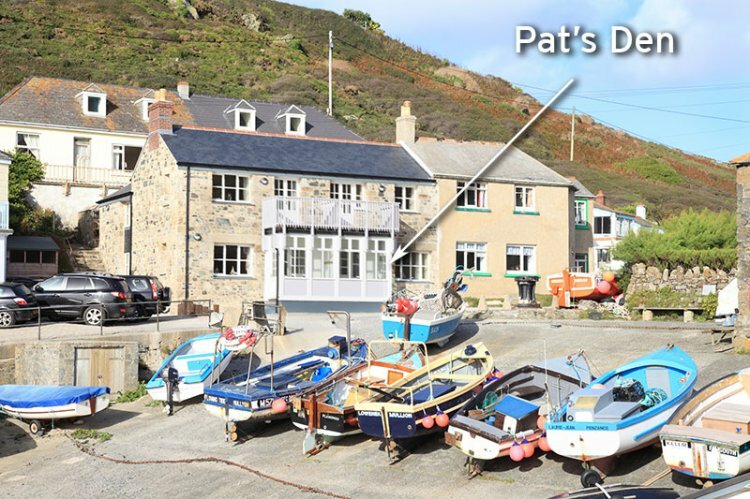 The cottages below are located on the same site as Pat&apos;s Den.